The Cumberland & Dumfriesshire Farmers Mart had forward 1,851 head ewes with lambs at foot and store hoggs at their sale at Longtown on Tuesday 10th May, 2011. Trade was again buoyant with plenty of buyers present and numbers short of requirements. Top of £84, £83 and £82 for Texel x hoggs with singles from Porterstown; Greyface £81 Rabygrange; Lleyn £72 Laneside. Hoggs with twins to £72 for Lleyn from Laneside; Texel £67 Colte Coats; Greyface £66 Old Police House. Geld Greyface hoggs to £109 Smithy Court. Greyface Shearlings with twins to £72 from Raby Grange; Texel £72 Bayles; Charollais £72 Bayles. Shearlings with singles to £71 for Greyface from Smithy Court. Ewes with singles to £80 for Greyface from Bayles; Texel £78, £77 Upper Cleugh; Cheviot Mule £75 South Mains, £71 Patties Hill, £70 Bayles; Lleyn £74 Patties Hill; Cheviot £64 Smithy Court; Blackface £44 Over Cassock, £42 Drumcork; Shetland £38.50 Sunnyside; Swaledale £37 Drumcork. Ewes with twins to £74 for Texels from Upper Cleugh; Greyface £71, £69 Bayles; Cheviot Mule £66.50 Patties Hill; Suffolk £66 Bayles; Cheviot £64 Smithy Court; Lleyn £60.50 Patties Hill; Blackface £44 Over Cassock, £42 Drumcork; Swaledale £39 Bayles. 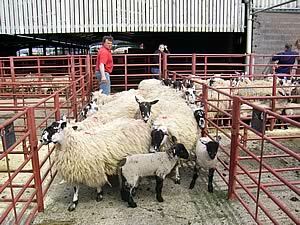 Store hoggs sold to £72 for Cheviots from Rosebank; Greyface £68.50 Harsondale; Suffolk £61 Rinligate. Feeding ewes to £70 South Mains.